Awesome outfit! Glad that day is behind you and time must help a little. Lots of love to you todY. Is that a Vince jacket? This is stylish and sassy! Love the distressed shorts on you Rae. Thanks for checking in with us, it's always great to hear from you. And yes, I remember this day two years ago all too well, I was in LA visiting when it happened. I am glad to see how you've come out of this a survivor not a victim. I'll toast to that! To life! Love the outfit - and, Love You. I'm glad to hear you're in a better space these days. Your outfit is fab. I want that yellow bag! Do you still live in LA? Too cold for me for shorts so just wondering if you're somewhere warm. Yippee!! Here is to marking the occasion with a smile. What a ride you've had, Rae, but how far you have come! Go Rae! So good to have a new vantage point for this remembrance. You look fab. Well hello there citron bag buddy :) You look fantastic Rae. So glad things are looking up for. So glad things are better for you :) YLF. I am happy you are doing well. You look great!!! Great outfit Rae, and great positive attitude. What a great smile you have! Your outfit looks stylish, relaxed, and upbeat. Time does have a way of mellowing painful memories. You look happy and stylish. A winning combination! Great sporty-RATE look! You wear it so well! You look super cute Rae! Great outfit - love the citron bag. Wonderful that you have turned a horrible experience into a positive lesson. You've come a long way, and you have such a great attitude! Kudos to you. And of course you look adorable! I'm so glad all that is behind you, and that you're in a better place now. Onward and upward! Hugs to you. Una, good eye! Navy paper leather scuba off Ebay. Huge love. Great weight for here! Elle, I am still in LA county, but we moved to Torrance. I think it's been similar weather to the westside, though it has been up and down in temps for sure. You're still looking wonderful! It's always a pleasure to see one of your outfits. I'm glad you continue to improve. Great look. Super cute tomboy. Glad things are going well, too. Fab Outfit. Sporty lux, I think. You make it look easy! 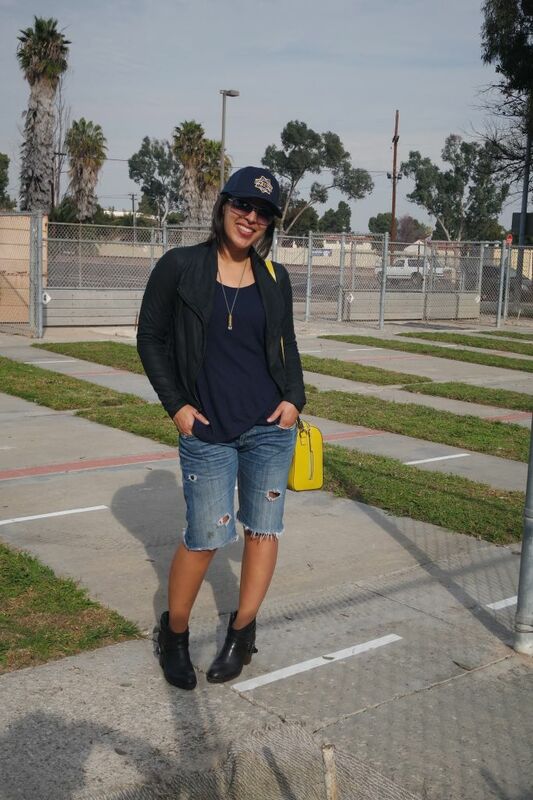 Love the look -- very LA with almost a "vintage LA" backdrop. Seriously, your setting looks like something out of a vintage sit com set in LA. I love the saucy cap and luxe booties and jacket! You are more than a survivor. You are a "thriver," Rae --- a wise woman who keeps her support system close and her feet moving forward. May this year be full of joy!